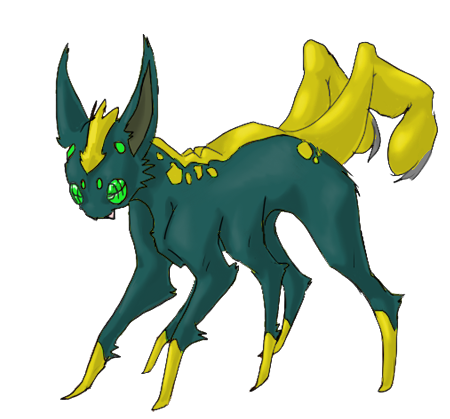 Pokédex Entry- Its two tails are actually legs that help it maintain itself on ceilings and walls. Its many eyes make it hard for opponents to sneak up on it. Evolution Method- The Eevee must eat a certain amount of bug pokemon and bug eggs in order to evolve. The amount depends on each Eevee. STAT build- Highest stats are ATTACK and DEFENSE. Lowest stat is SPECIAL DEFENSE. Not one of the more popular eeveelutions. Tends to be a shy pokemon, or rather, not one to venture out often, hermiting itself in the wild. Their habitats are mostly underground, much like trap spiders, though some are fond of tree life.